Police are appealing for information after a rucksack containing items worth more than £300 was stolen from a train. 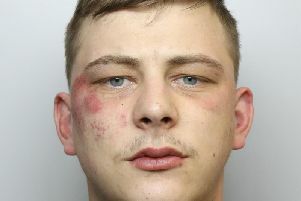 The theft took place on board the 3.54pm Peterborough to Leeds service on Saturday August 20. Police believe the rucksack, which contained a mobile phone, glasses and other personal items, was stolen from the overhead luggage rack as the train travelled between Doncaster and Leeds, and that the person responsible may have left the train at either Wakefield or Leeds stations. The man in the image is someone police think has information about the incident. Anyone with information is asked to contact British Transport Police on 0800 40 50 40, or text 61016, quoting reference 201 of 8/9.